Ah Zoobilation. 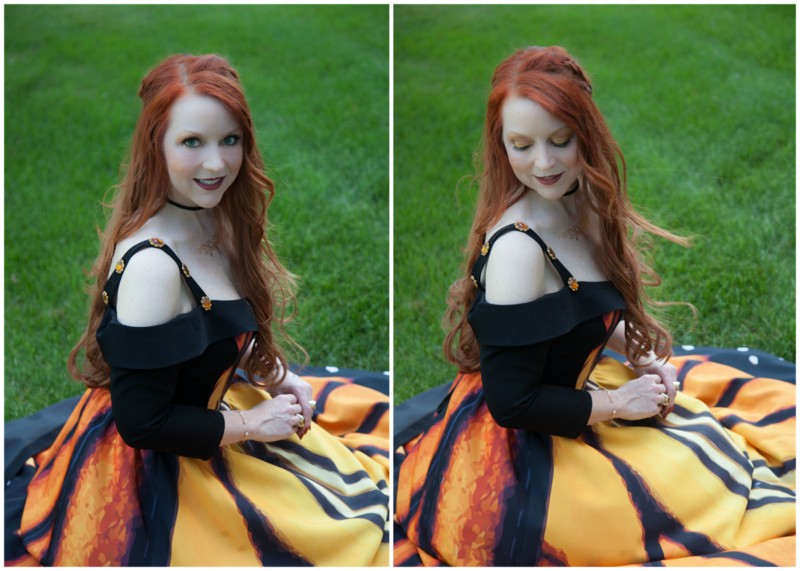 The Indianapolis Zoo's annual fundraising extravaganza is always one of my favorite events, and this year's 30th anniversary celebration was no exception. Despite 90 degree temperatures, more than 5000 guests turned up and turned out in all manner of animal inspired attire. Without question, the night's "Keeping It Wild" theme was evidenced in a seemingly endless parade of leopard suits; snakeskin shoes; peakcock feathers; and even a few flamingo hats. You can check out a few of the evening's more colorful ensembles here. My own Zoobilation dress was months in the making. 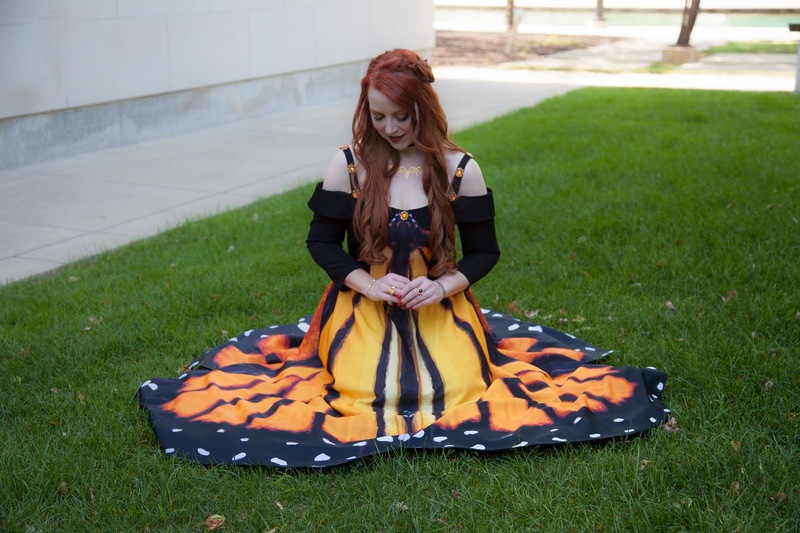 I'd been thinking about a monarch butterfly themed gown for more than a year, and when I found the perfect fabric on Spoonflower, I looked to local Indianapolis designer Daniela Upshaw to bring my vision to life. 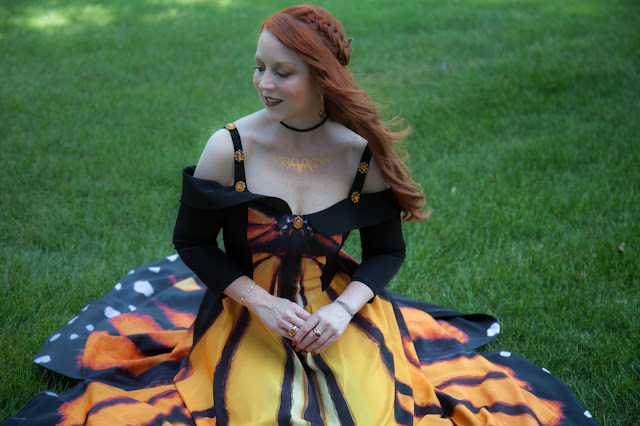 A native of Bulgaria and self-taught in couture techniques, Daniela specializes in made to order, one-of-a-kind designs through her business, DanielaStyle. Indeed, she has never made the same dress twice, and prides herself on creating garments specifically designed to complement the individual women for whom they are made. 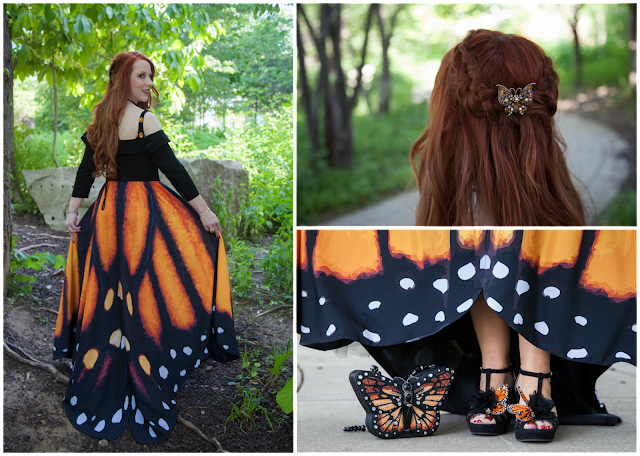 This was my first time to work with Daniela, and our close collaboration yielded one of the most beautiful and unique dresses I've ever owned. 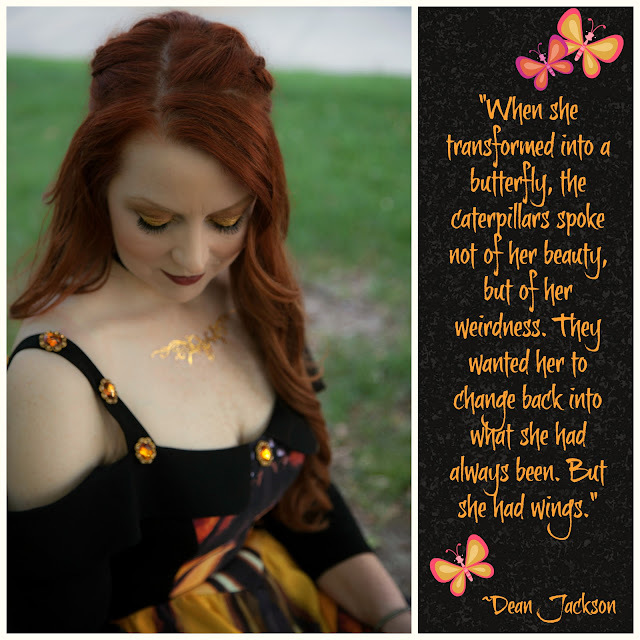 I appreciated her willingness to listen closely to my vision, and the care she took throughout several fittings to make sure the final product was everything I wanted it to be. Thousands of hand stitches and thoughtful construction details in the lining of the dress also ensured that it wasn't too heavy for a Summer time outdoor event, and that it could withstand hours of traipsing around on concrete and grass without incident despite having a short train. 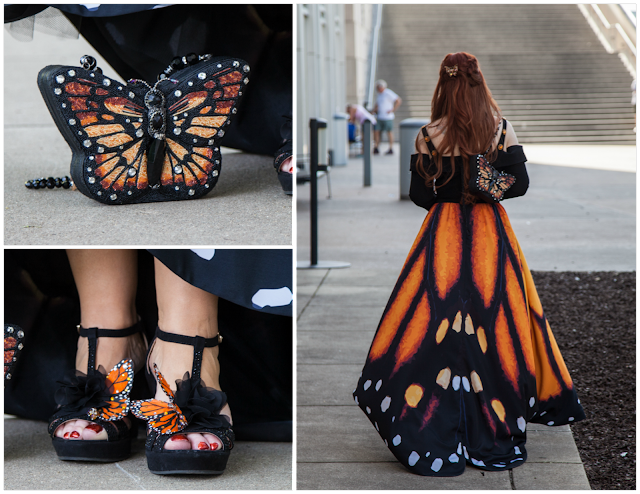 Of course, when it comes to a theme, you know I'm always all in, so I couldn't resist an intricately beaded Mary Frances handbag in a monarch pattern; and I embellished my black dress sandals with chiffon flowers and a pair of butterflies that started life as earrings (an eBay find). 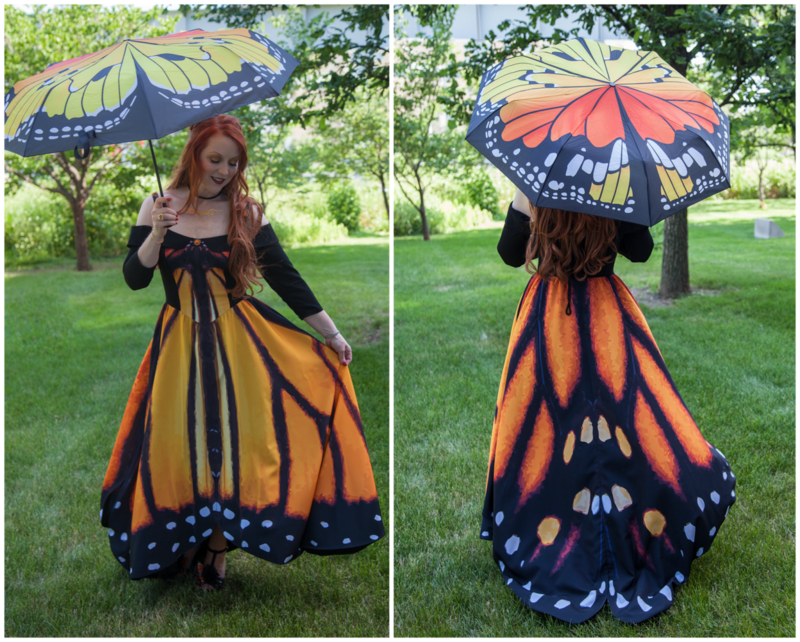 A small crystal butterfly secured the braids in my hair, and I hedged my bet against the rain with a complementary monarch wing umbrella from Amazon that also brought much needed shade before the sun set. Though I was happy to kick my shoes off on the way home after a night of drinking, eating, and dancing with a few thousand fellow Hoosiers, I have to admit putting the dress away was a little bitter sweet, and I have no doubt I'll find reason to wear it again. Thank you Daniela, for helping me spread my wings! All photos courtesy of Faith Blackwell Photography. Oh, Elizabeth, thank you so very much! Yes, I think I would wear this dress weekly if I could. Indeed, it felt very romantic and magical to wear it. I really appreciate your kind words! I saw you there last year! I thought you looked so pretty in that dress! It was perfect on you! 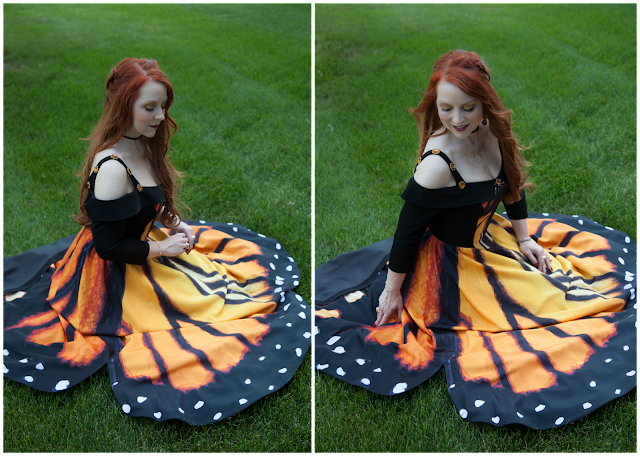 Not that I wear anything as creative and pretty as you, but I'm already thinking about what I should wear this year. God bless!